It seems incredible to me that this April, in 2012, we’ll be celebrating National Poetry Month on Tattoosday for the fourth year in a row, by showcasing the tattoos of poets. Not necessarily literary tattoos, but tattoos of the literary. When the idea first struck me in early 2009, I didn’t know if a) it would work, and b) if I would be able to pull it off. Every year, somehow, I manage to execute at least thirty days of inked poets, and, with apologies to Lennon/McCartney, I get by with a little help from my friends. 2012 is slightly different. Faced with a big family event in February, I got an early start and went from worrying about not filling the calendar to the heretofore unimaginable - too many contributions? Someone posted the call for submissions on a UK writer’s board, and I was flooded with e-mails offering up their poetry and ink. I started - gasp!- to decline inquiries. The end result is a month packed with tattooed poets. There will be days with double posts so, if you are in the habit of checking in daily, you may want to visit back in the evenings, as well, so as not to miss anyone. Of course, I always point people to the Tattooed Poets Project Index (www.tattooedpoets.com) to get the complete rundown. Thanks for checking in, and happy national poetry month! A familiar face passed me in Penn Station a couple weeks back and I jumped at the opportunity to talk to him - it was RoBear, from the TLC series NY Ink. For those of you not familiar with the show, RoBear is the floor manager at Wooster Street Social Club, the setting for the show. I first encountered RoBear last May, when I was one of the lucky people selected to take part in "Roosterfest," a fundraiser segment of episode seven on season one. $50 rooster tattoos were on order and I got, in my opinion, the best one - from Megan Massacre. I documented the experience here. So, here I was, talking to RoBear in Penn Station and, well, I had to ask, would he mind sharing one of his tattoos? "I got the tattoo to commemorate my friendship to the girl who named me Robear when I was sixteen. We met at a BIGLNY (Bisexual, Gay and Lesbian NY) youth group back in the day at the Gay & Lesbian Community Services Center on West 13th Street and right after meeting she said I was 'cute, a little furry and that she was going to call me Robear.' It totally stuck and she has never one since called me by my birth name, which is Robert. So, after getting the job on NY INK, since the name was so catchy, I wanted to thank [Natascha] and celebrate our friendship that has spanned almost 20 years now ... my artist, Tony Silva of High Roller Tattoo in NY, and I came up with this pinup specifically for her. [Natascha] is a pastry artist and chef in Manhattan, so I did the bakers hat, apron and her holding one of her own cakes she has made. Her website is Artesenal Sweets ... She is a constant inspiration and muse for me and all I do with my fashion, interior design and culinary arts, since she emcompasses everything that is beautiful and creative to me. A truly unqiue and special woman that will be in my life forever." I want to thank RoBear for sharing this tattoo with us here on Tattoosday. It's obviously a piece with a lot of deep personal meaning, and he was kind enough not only to let me take a photo in Penn Station, but also to send along more pictures and give me a complete back story. You can catch RoBear on repeats of NY Ink on TLC. Still no word on whether the show will be picked up for a third season. You can also become a fan of RoBear on his Facebook fan page here. It's always a bonus when I run into a tattoo artist somewhere other than a tattoo shop. For example, I spotted Matthew Adams on the platform of the 34th Street Station, waiting for a downtown A train last week. Matt works at Sacred Tattoo in Manhattan with Lalo Yunda, who is the artist that inked this incredible skull. 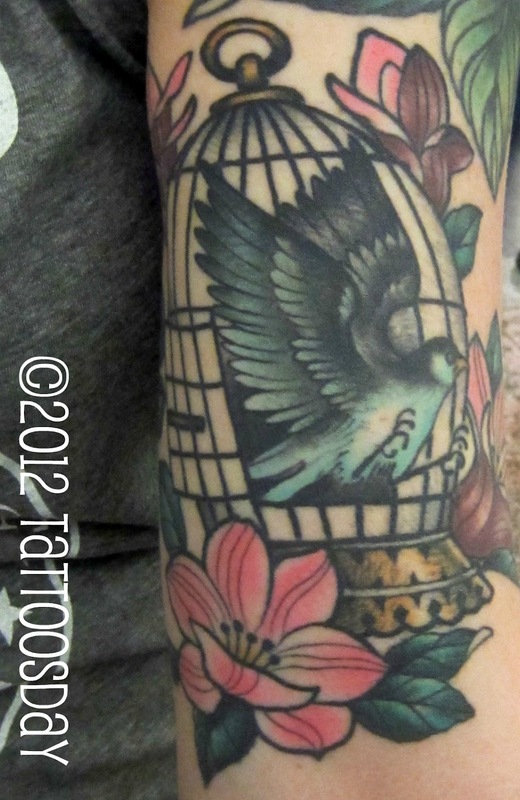 As it turns out, I have featured Matt's work on the site before here and here, as well as this piece by Lalo. Today is the first day of spring! It's always a joyous time here at Tattoosday, as the temperatures rise and all the tattoos of my fellow New Yorkers come out of hibernation. This rose, on the upper left arm of a woman named Marianna, was just popping off of her skin having been freshly inked the day before by the talented Eli Quinters at Smith Street Tattoo Parlour in Brooklyn. Eli's work has appeared previously on Tattoosday here and here. Marianna had a lot of other interesting work in progress going on, so perhaps we shall see more from her in the future. In the mean time, however, we have this lovely rose which she offered up in celebration of the end of winter. 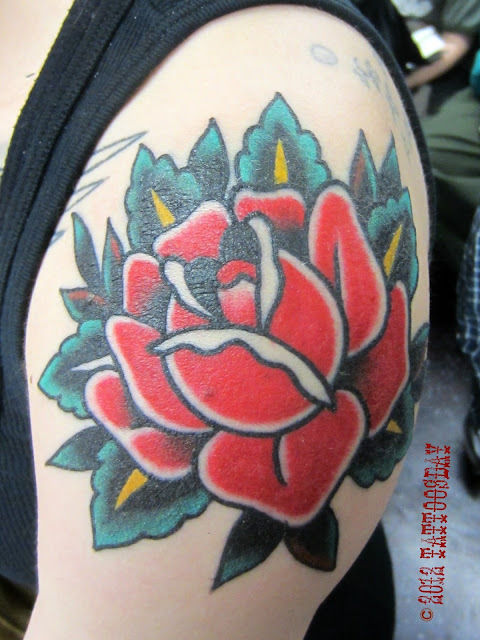 Thanks to Marianna for sharing her beautiful flower with us here on Tattoosday! Camille told me she went to her artist, Fernando Casillas, at Think Ink Tattoo in Norman, Oklahoma, and just told him she wanted a bird flying out of a cage. "I just like the idea of setting yourself free," she explained. Work from Think Ink has appeared on Tattoosday previously, here. It wasn't until the following day, when I noticed that Camille had followed us on Twitter, that I realized that she was a musician. I had caught her while she was heading back to Oklahoma, and was nervous about catching the right train and making her flight in time. Camille, as it turns out, is Camille Harp, a singer-songwriter from a musical family, who has an album forthcoming called "Little Bit of Light". If you go to CamilleHarp.com, you can download her song "One by One". It's a lovely song that only makes me wish I could hear her in concert. She has a wonderful voice and soulful tone. You can also grab her record "Like the Rain" here. Thanks to Camille for sharing her tattoo with us here on Tattoosday! Please check out her website and/or her fan page on Facebook and support this wonderful artist! Last week, I spotted Jason walking through Penn Station and took the opportunity to ask him about some of his tattoos. 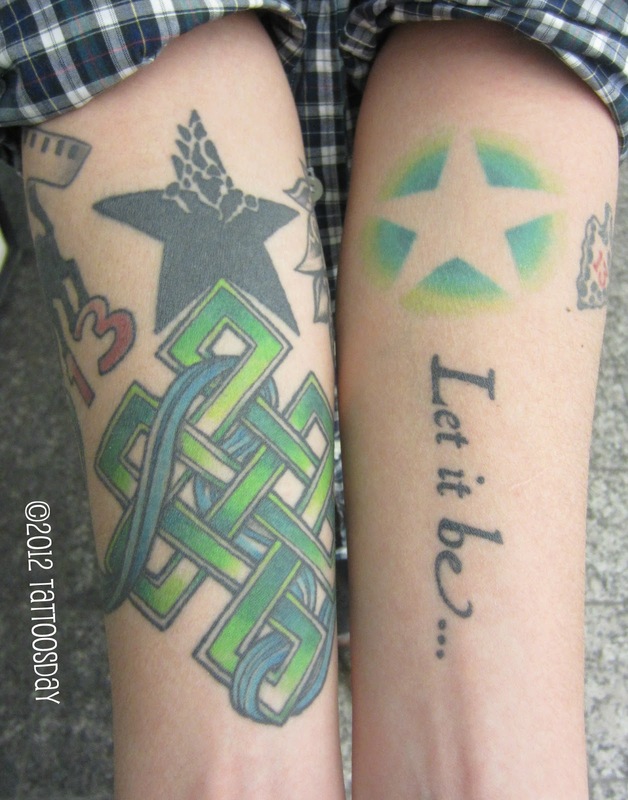 He says he has about twenty-four in all, so I took a picture of his forearms, from the photo here you can see six of them, including a Celtic knot and the phrase "Let it be...". "The crumbling star was originally meant for my broken aspirations, something I dreamt up when I was a kid. And then, the outline of the green star ... the green, for me, it means rejuvenation, you know, new ideas, new paths, just different things to inspire me." 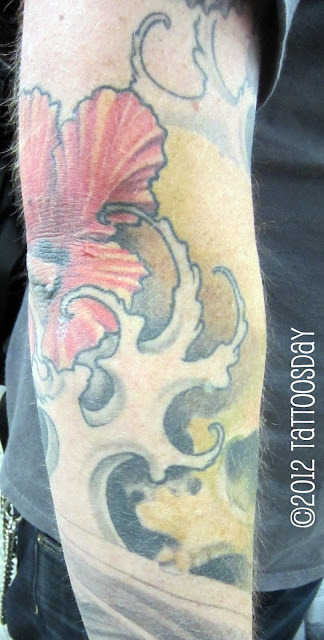 The two stars were not done at the same time, but the crumbling star was inked at Addiction NYC in the East Village. The green star followed a couple weeks later and was completed in Brooklyn, at Inkman Tattoo Studio. Jason told me he likes to get new tattoos when he travels, what I like to call a "tattoorist," if you will. New ink is always a great way to commemorate places one has visited. Thanks to Jason for sharing these two stars with us here on Tattoosday! A couple weeks back, on an unseasonably warm and sunny February day, I spotted Steve on Penn Plaza, wearing a short-sleeve shirt, with some pretty cool ink peeking out from his arm. Take a closer look - this is pretty cool. I spoke to Steve at length about his work. He had recently left the U.S. Marines, where he had been stationed overseas in Japan. It was there that he chanced upon an artist named Aya, at a shop called Silent Ink, located in the city of Iwakuni. As Steve, explained it, Aya is a deaf-mute (thus the shop name) and he became a huge fan of her work while serving in Japan. "It's a full zombie apocalypse scene," he told me, and he plans to fly out to Washington State when Aya next travels to see her fiance in the U.S., so she can complete the work. Steve estimates that she has already spent approximately 38 hours on his canvas over several sittings. "I like to sit for a long time," he told me. I certainly look forward to hearing back from him when Aya has completed this work! 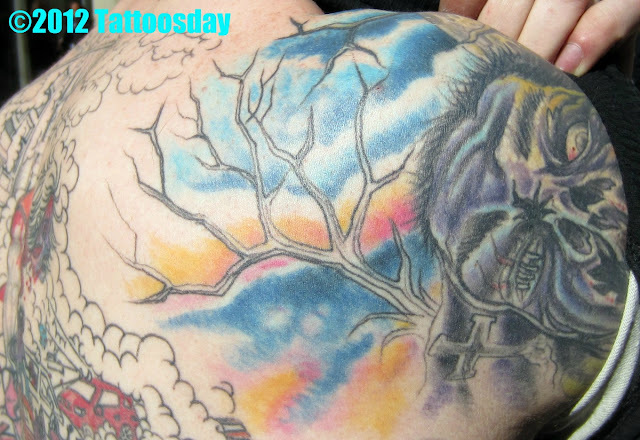 Thanks to Steve for sharing his ink with us here on Tattoosday! So I'm digging these inkbursts for now. This is the third in the series, each piece composed on the New York City subways. On Thursday it was 60 degrees in the Big Apple and, I read somewhere that this has been the fourth warmest winter on record. You wouldn't know that from the paucity of posts these last few months, but that doesn't mean I haven't been busy. We had a bat mitzvah to throw in February, and I have been working behind the scenes recruiting contributors for our upcoming fourth annual Tattooed Poets Project in April. To which I can exclaim, "More poets! More tattoos! More FUN!" I used to feel guilty about letting a day go by post-less. I pictured inked fans worldwide waking up bright-eyed and bushy-tailed, only to be gravely disheartened by yet another day gone by without a new Tattoosday post. No more. This blog is neither the center of my universe, nor a viable way to help support a family of four. I have come to terms with that. But, with spring rapidly approaching and blog traffic at an all-time high (50,000+ visits per month in January and February! 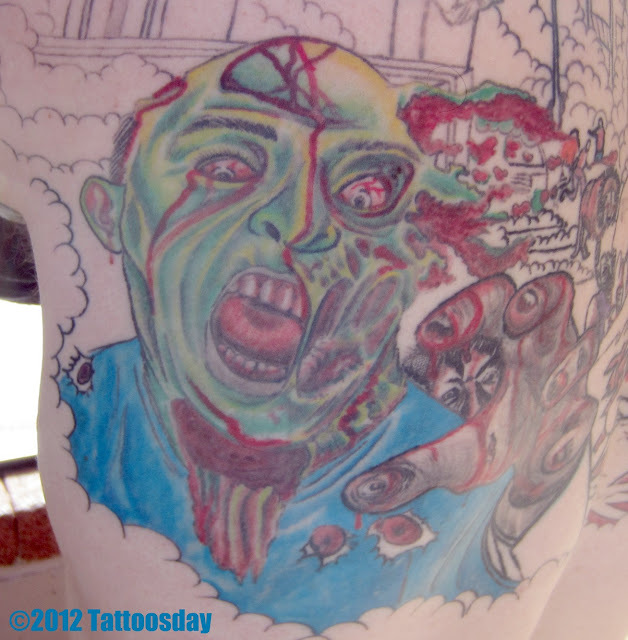 ), I am in high spirits and am hoping to do a lot of great things with Tattoosday in the months to come. Thank you for checking in and checking us out! She explained that November 7, 1958 was her mother's birth date. Danielle was just a little girl of eight years old when her mother passed, and she got this, her only tattoo, to memorialize her mom. One night a man had a dream. In it he was walking along a beach with the Lord. Across the sky flashed scenes from his life. For each scene he noticed two sets of footprints in the sand, one belonging to him, and the other to the Lord. When the final scene of his life flashed before him, he looked back at the footprints in the sand. He noticed many times along the path of his life there was only one set of footprints and realized that they came at the hardest and saddest times of his life. Bothered about this, he questioned the Lord, saying "Lord, you said that once I decided to follow you, you'd walk with me all the way. But I have noticed that during the most burdensome times in my life there is only one set of footprints. I don't understand why when I needed you the most you would leave me." The Lord replied, "My precious child, I love you and I would never leave you. During your times of trial and suffering when you see only one set of footprints, it was then that I carried you." She had this done at a tattoo convention by an artist from Long Island's DaVinci Tattoo Studio. 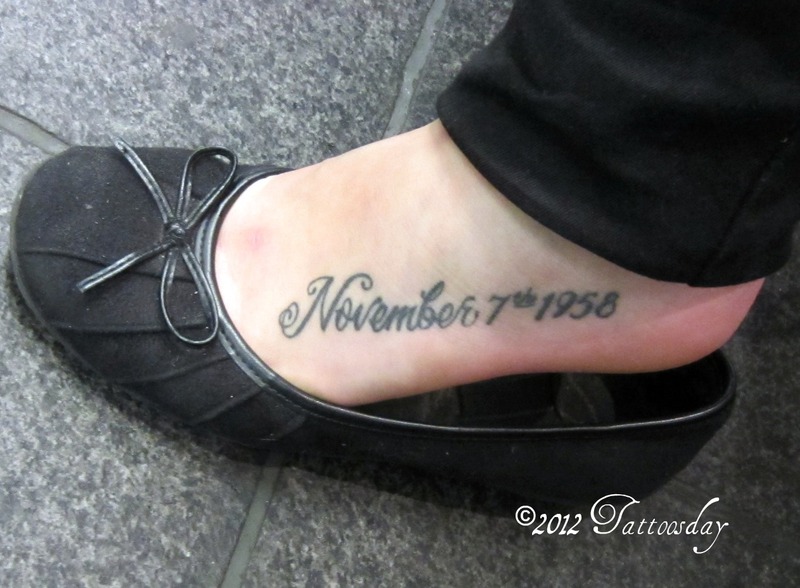 Thanks to Danielle for sharing this very personal tattoo with us here on Tattoosday! I take pride in the fact that I can sit on a train and spot tattoos. I'm not talking about the obvious, but the subtle. Remember, I have been inkspotting for over four and a half years (!). I am adept ar detecting scribbles on feet, a word on an inner wrist, and the edges of sleeves peeking out from under sleeves. Does this help me? Rarely. My general rule is, if I can't identify it, I won't ask someone about it. Imagine, someone walking up to you and asking to see more of your barely visible ink. 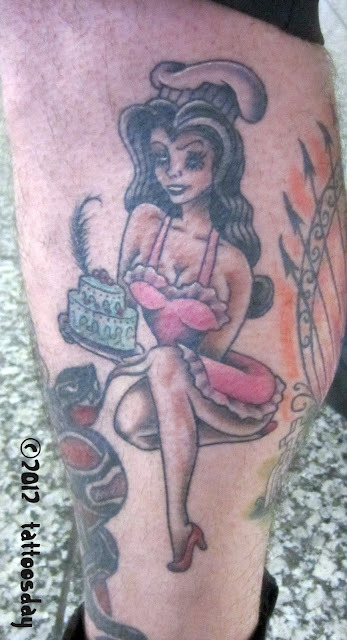 It reeks of creepiness, a characteristic I so desperately want to avoid, as it is well-documented that the world is full of people who do not respect tattooed people's boundaries, and often demand to see someone's tattoos, as if it is their right. This all started because I spotted an interesting shape on a guy's inner left wrist on the R train this morning. I wanted to ask him about it, but I didn't. It was way too early for that. I am writing this post on the subway, on my Samsung Galaxy S II's Blogger app, in what I will call an "Inkburst." That is, a small, mini-post, that I hope people find interesting. Readers may notice that there aren't a lot of comments on this site. I have a filter set up that requires my approval before a comment sees the light of Tattoosday. I tend to approve benign and positive statements, and reject ads, spam and, more controversially, negative remarks. Why won't I allow negative feedback? I think it's counter-productive and it goes against the grain of this site's philosophy - meeting and appreciating tattoos. So, when a recent reader named "Anonymous" dropped comments blasting two posts, they didn't make the cut. And, I agreed with his or her opinion about one of the posts! But this site is not always about museum-quality body art. Sometimes, bad, or merely average ink is interesting, too. If you want nothing but high end work, I recommend Tattoo Snob. The way I see it, if I hand a flyer to someone on the streets of Manhattan, and they're on the fence about contributing, they'll be less likely to participate if they think there's a chance of getting flamed by a inktroll. I do occasionally let a constructive comment through, however, if I feel it is relevant to a piece's flaws, and it is written objectively, and not soaked in sanctimonious venom. Feel free, however, to praise away! And thank you again for visiting us here at Tattoosday! Readers of Tattoosday first encountered my friend Brooke's tattoos here (in 2007) and here (in 2008). I work with Brooke, as well, and we often chat about tattoos. A year or two ago, she had told me she was done getting inked. But, you know what they say, never say never. So I was not terribly surprised a few months back when she and I talked about new work she was thinking about. "My grandfather and I decided about six-plus years ago that we were both going to get tattoos. And he doesn’t have any tattoos. So, we thought it would be cool - one quote that he’s always said to me over and over again was Winston Churchill's 'Never, never never give up.' So, we thought, all right, it would be really cool to get this tattooed on us, but let’s do it in Japanese, or Chinese, or something, so we both started doing some research and trying to find someone we trusted ... neither one of us could really come up with anything that we felt comfortable with. So, we just never did it and then he got sick … he’s been in and out of hospitals for five years now. He ended up in the hospital in the beginning of December, so I went and saw him at the beginning of January - they weren’t sure if he was going to make it or not. I wanted to try and get the tattoo before I went out there, so I scrambled - you know, something to kind of cheer him up and make him happy and I couldn’t really pull it together, so I just didn’t do it. One night [in San Francisco] when I left the hospital, I went looking for something to eat and found myself in Haight-Ashbury and decided to pull over and just go walking around and I walked past a tattoo shop [Soul Patch Tattoo] and I just went in to browse - I didn’t go in thinking I was going to do anything. I just started looking through the artists’ work and the guy asked me if I needed help and I said, 'Naw, I’m okay,' then like, 'You know what, actually...do you have anyone who can do Japanese kanji?' He’s like, 'Yeah,' and points to the girl next to me and he said, 'she can'." So the next thing you know she goes in the back and draws it up and I’m grtting a tattoo. I mean, it happened so quickly and so I was really happy … the next day I was able to go back and show my grandpa in the hospital ... he was really happy with it and loved it. The cool part is that I got it done, I got it done by someone I trusted and he was able to see it and he loved it." Unfortunately, Brooke's grandfather, Bill Rhodes, passed away a few weeks ago on February 8, just weeks after seeing his granddaughter's tattoo, which had made him so happy to see. You can read his obituary here. His spirit lives on in the lives of many, one manifestation being the line of kanji running down Brooke's back. 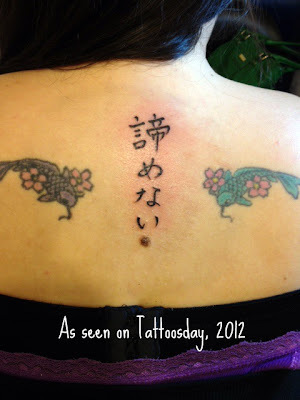 Thanks again to Brooke for sharing her tattoo and the wonderful story behind it here on Tattoosday! And thanks to Bill Rhodes, for helping inspire this tattoo.